Ever stumble upon new habitat in your own backyard? Found just such an area the other day, hidden in plain view in the heart of the valley. It promises to be a "Hot spot" for sparrows. Henry and I had one of those "life" experiences today. The swallows were migrating in force (six sp. 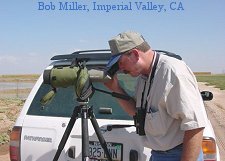 seen) and we were standing beside an irrigated field with ibis, egret, curlew and gulls numbering well over ten thousand birds. With rain showers and sunlit clouds for a background and the sun at our backs, the whole mass of birds took to the air!! I know! We looked for the Peregrine too. Just plain restless birds I guess. A video camera would have paid for itself in the awe inspiring minutes that followed. The masses began to coalesce into individual groups of species circling over and around us. As the gulls circled higher and faster the white Cattle Egrets were all landing in the tops of the Eucalyptus trees towering over us. 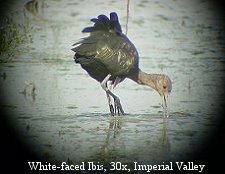 The Whit-faced Ibis, looking black while flashing iridescent greens, and the Long-billed Curlews filling the void with cinnamon. WOW! Several Clark's Grebes with downy young in tow and the Dusky Flycatcher were at Ramer. Osterkamp held the only peeps, Dowitchers and the 2 Dunlin seen all day. The Peregrine?! Care to wager a soda pop? The Peregrine will be sitting on the first double power pole North of the Palm tree! The palm tree being on McConnel Rd. 1/4 mile North of Harris Rd. and on the Northeast corner of the Osterkamp Ponds. The Sandhill Cranes are also back in small numbers and roosting in that area.